Are you looking for a cheap, cheerful and high impact way to add some instant curb appeal to the front of your house this season? 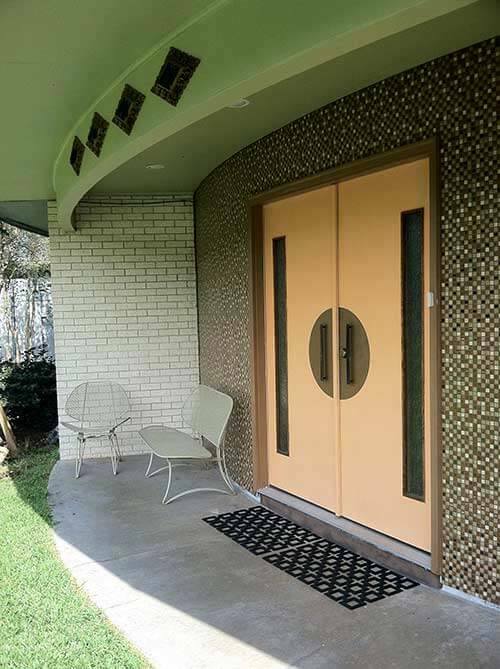 We love this idea — reader MidCenturyThriftyGal shows us how she used our favorite mid century paint collection to transform her plain garage door into a cheery mid century modern garage door. 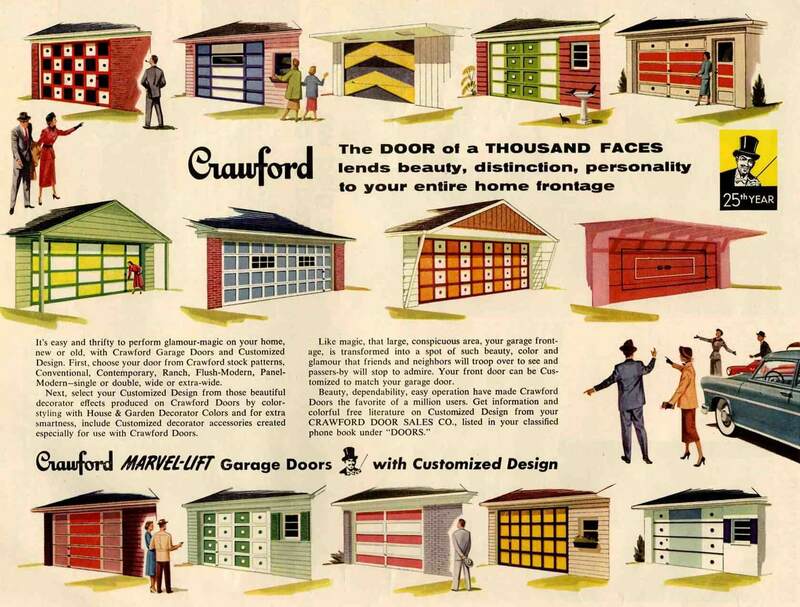 Pam featured this vintage 1955 Crawford garage door ad on the blog in 2008. 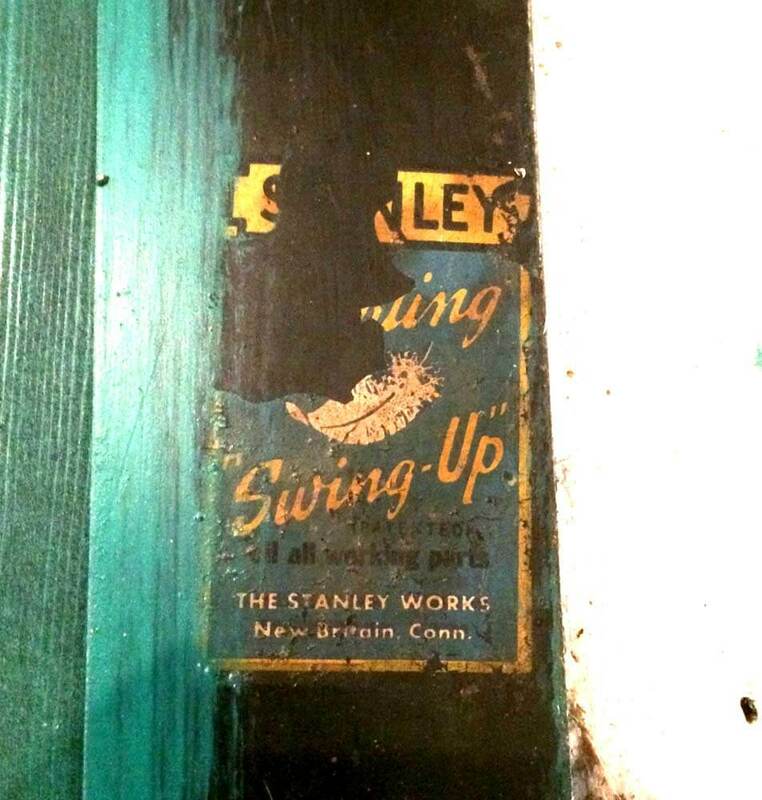 Click on this photo to enlarge the ad — to get even more ideas how to paint out an existing garage door go give it mid century modern design pizzaz. MidCenturyThrifty Gal didn’t need to buy a new garage door to get the modern garage door design she wanted. 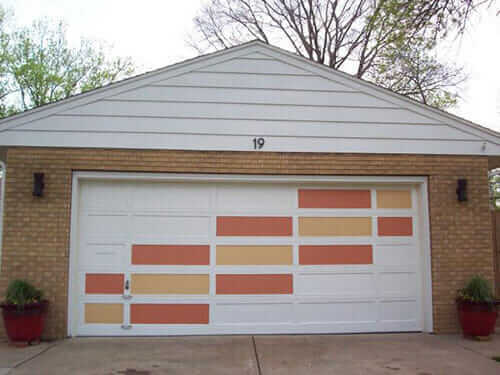 Instead, she used her existing garage door … chose two colors from the Sherwin Williams Suburban Modern paint collection that complemented the red-gold color of the brick on her house… and then painted out some of the existing rectangles on the garage door to create a mid century modern geometric design. The colors she chose are Caribbean Coral and Harvest Gold. It is amazing what a little paint can do to add retro appeal to an otherwise plain garage door. Kudos to you MidCenturyThriftyGal — on a job well done — and thanks for allowing us to share this photo of your freshly-painted garage door. 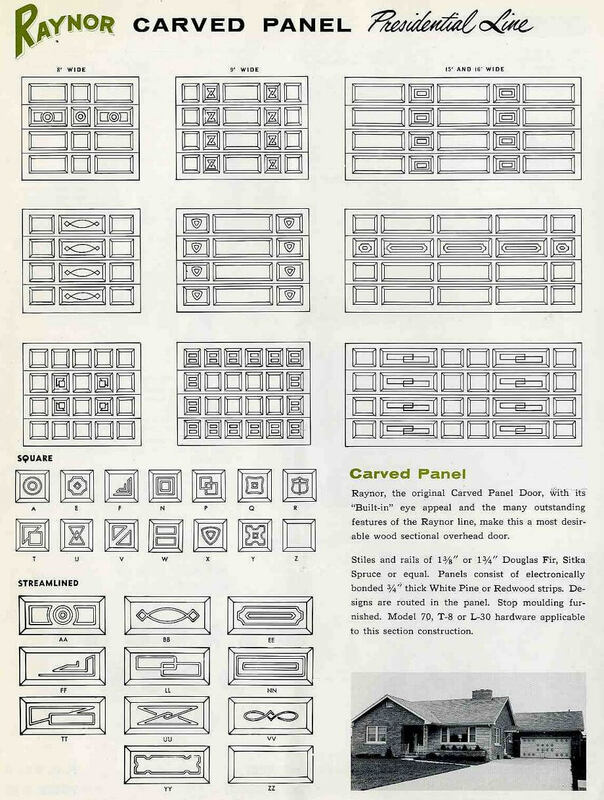 Also check out this six-page catalog (page shown above) that we featured in 2010 — it shows lots of ways to add wood trim to great terrific mid century modern garage door styles. We painted our garage door based upon seeing the first flyer in one of Pam’s earlier posts. Our garage is detached and set back off the street and our house is red brick. We went with the second row, second from the left–white trim grey panels. Looks great! My mom painted our kitchen cabinets those colors in the late ’60s (top pic). Still one of my favorite color combinations that reminds me of sitting in the breakfast nook and coloring while mom made dinner. What a fab idea,MidCenturyThriftyGal!! Kudos to you! This post is timely I am on holidays at the moment painting my garage. It is set back from the street behind large gates although you can still see it as I am on a hill. I have painted the facia boards black gloss the eves pink the walls a light green (all vintage tinted colours). I got the oversize double garage door made out of plywood so I will be painting a triangular abstract pattern on the door. There was a house with that pattern about 20 mins away has since sold don’t know if doors have been painted over. Always take photos of interesting houses as the ideas are handy and can be used in your own home. I am lucky there is no homeowners association otherwise I would be run out of the neighbourhood. Most of my neighbours are pretty good. Thank you Kate and Pam for showing my garage door! Hopefully it will now inspire my mid century dwelling neighbors to move on from plain white. Thanks for letting us feature it. 🙂 You did a great job MidCenturyThriftyGal!